The equation is simple: the more money and education you have, the more likely you are to be in good health. The equation for reversing this trend, however, is a bit more complex. Impoverished and minority populations have long suffered the burdens that stem from health inequity, such as higher rates of infant mortality, diabetes and heart disease and lower total life expectancy. The story of breast cancer has been no different. Over the past five years in the U.S., the breast cancer mortality rate has gone down among white women, yet remained relatively stable among African-American women, according to a recent report from by Susan G. Komen Columbus on breast health disparities. The resulting inequality is significant. 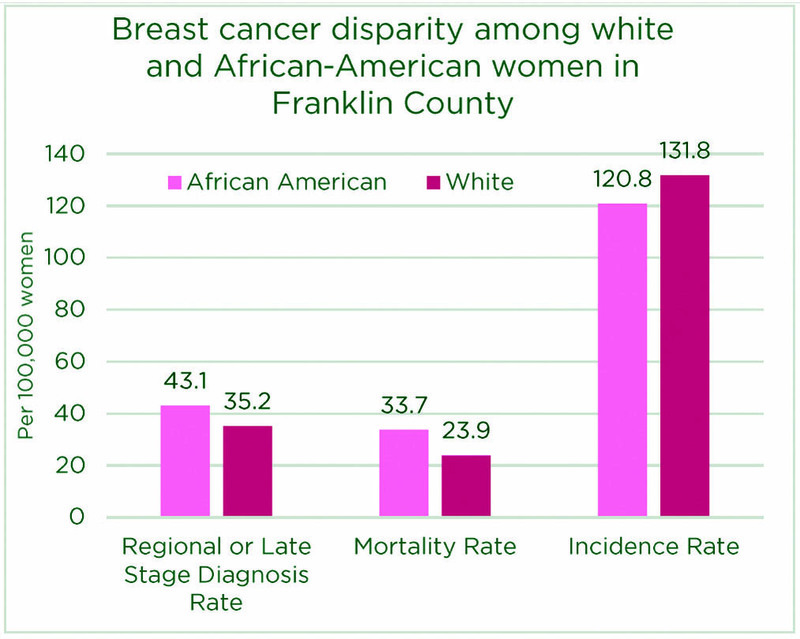 Nationally, the breast cancer mortality rate is 40 percent higher for African-American women compared to white women, and 41 percent higher for African-American women in Franklin County, according to data from the National Cancer Institute and Centers for Disease Control and Prevention. Faced with this clear divide, Susan G. Komen, the parent nonprofit that oversees about 100 affiliates, saw the opportunity to dramatically improve breast health. Last summer, the foundation set an ambitious goal: to cut U.S. breast cancer deaths in half — from 40,000 to 20,000 per year — by 2026, said Julie McMahon, director of mission for Komen Columbus. To make such a powerful improvement will mean taking extensive action to reduce breast cancer disparities. And with Komen already investing around $200 million into ongoing breast-cancer research and clinical trials across the country, Komen Columbus thinks the real platform for change will be found at the community level. “Health care doesn’t happen in a vacuum; people can only make as healthy choices as the ones available to them,” McMahon said. For African-American women, risk factors include a history of lower access to and engagement with the healthcare system, delays in follow-up care, lower-quality screening and treatment options and biological predispositions to aggressive breast cancers such as triple negative breast cancer (TNBC), McMahon said. According to the Komen Columbus report, nearly half of African-American breast cancer deaths in the Columbus region occur in just five ZIP codes — North Linden, Whitehall, Northeast Columbus, Forest Park East and Southeast Columbus. Because these ZIP codes pop up for a lot of different issues, such as lack of education, employment and access to health insurance and care, those problems have also come under the lens, McMahon said. Down the road, McMahon and others at Komen envision a world where public services ranging from food and housing to early-childhood development and breast-cancer prevention become streamlined, so that when a woman is getting employment help or going to a diabetes consultation, she is also referred to screening or genetic testing for breast cancer, McMahon said. “Over time this could become a paradigm change for communities where preventative health has never been a priority,” she said. And it’s not just vulnerable populations among which there is room for improvement. Higher income women with private insurance could benefit from employers allowing work time to be used for appointments or increased availability of before- and after-hours appointments, as noted in the report. Despite challenges ahead, such as a lack of available local data on health and ethnicity and potential future setbacks to the Affordable Care Act, Komen will keep working toward its goal of fostering communities “in which the color of your skin, your income and where you live doesn’t impact your chance of survival when someone tells you that you have breast cancer,” McMahon said.